Oh man, I’ve had so much fun showering you guys with pumpkin recipes this past week. I love theme weeks! I hope you have enjoyed this little glimpse into my pumpkin obsession. After today, I promise to put the pumpkin down and walk away (at least for a little bit). I’m not sure if you noticed or not, but many of the recipes this week ended up being free from animal products. It’s not my secret way of telling you I’m going vegan or anything (I heart cheese and eggs too much for that to ever go well). It just so happens that pumpkin is a wonderful substitute for animal products in many dishes. It adds moisture, sweetness, and flavor like cream or butter would. It’s got the creamy texture of a lot of dairy products. And it binds a lot like an egg would. The binding properties of pumpkin is what I was really relying on for this pasta. 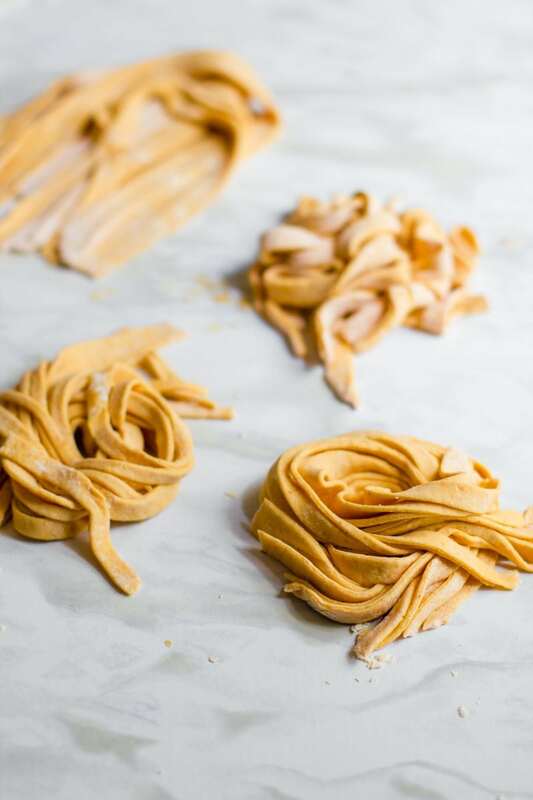 I’ve seen recipes out there where folks mix pumpkin puree into traditional fresh egg pasta, and that’s great, but I had a hunch that you could maybe skip the egg entirely and just make a straight up pumpkin pasta. And I was right! 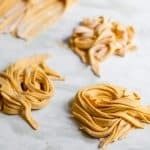 Leave out the egg, just use pumpkin, and create yourself a big, glorious pile of beautiful vegan pasta! 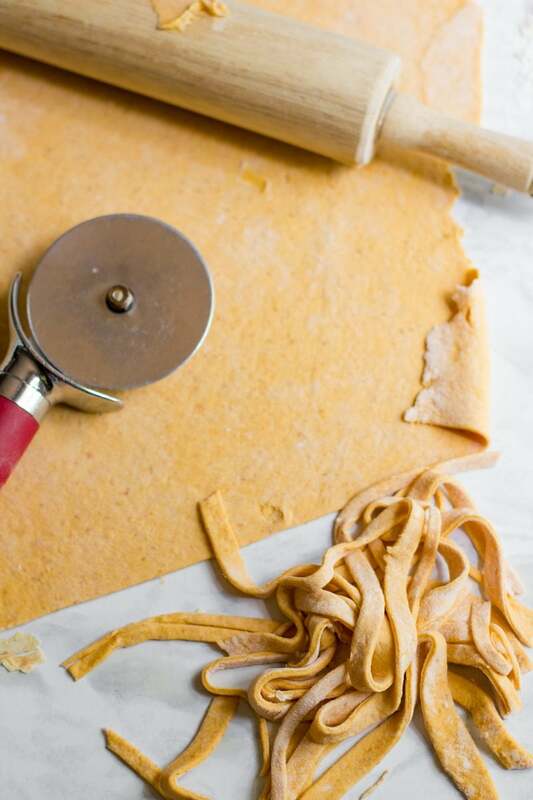 If you’ve ever been afraid to make fresh pasta at home, this recipe is a great place to start. It literally has two ingredients—flour and pumpkin puree. If you want to get real wild and crazy, you could add a third ingredient—salt—but I cooked my pasta in salted water, so it wasn’t necessary. But it’s up to you. And even better than the tiny number of ingredients? 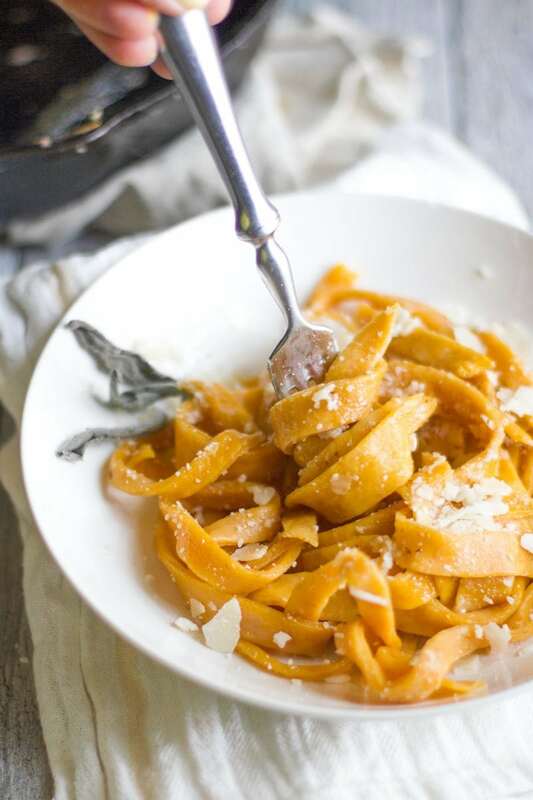 This fresh pumpkin pasta requires no special equipment. If you have a pasta roller and cutter and want to use it, go right ahead, but don’t be shy if you don’t. 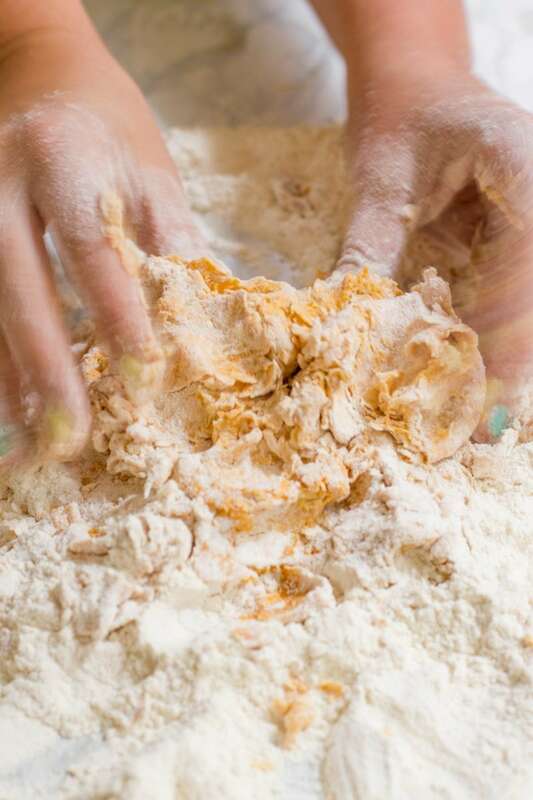 Just roll the dough out thin with a rolling pin and cut rustic noodles using a sharp knife or pizza cutter. I promise it’ll taste just as delicious. 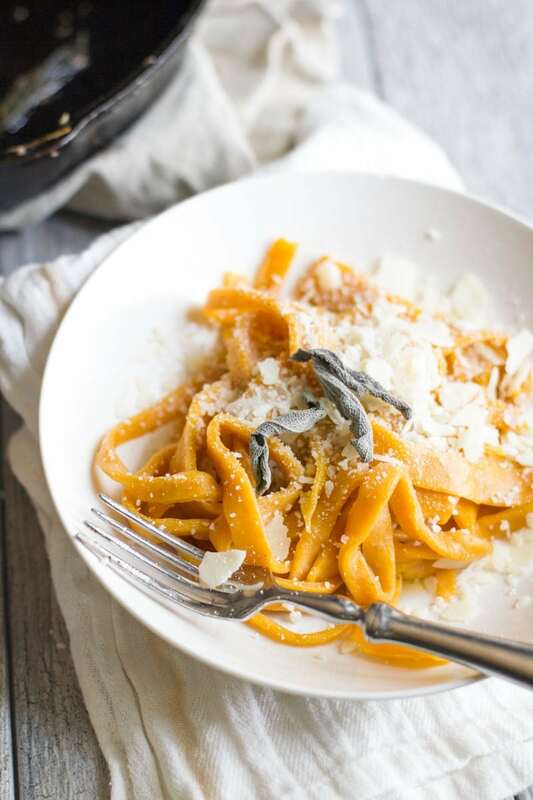 This fresh pumpkin pasta would be wonderful in a cheese ravioli, or even with a white-sauce lasagna, but I kept it simple and drizzled this amazing browned butter and sage sauce over top made with sage from our garden (that is drying in a beautiful bundle over top of our kitchen sink). The sauce takes all of about five minutes to make, and is the perfect complement to the sweetness of the pumpkin in the pasta. Of course, the butter and cheese kinda negate the whole vegan pasta concept, but hey, balance. If you want to keep your pasta dish free of animal products, you can replicate the sauce using one of the many vegan margarines out there and just skip the cheese—I’m sure it’d still be delicious! When I served this up to my husband the other night, I asked him if this was a worthy dish to end Pumpkin Week on. And, with a mouthful of pasta, he looked at me and muttered, “I could eat this all day, everyday.” So I take that as an affirmative! Thank you so much for tolerating my pumpkin obsession over the past week. I’ll be back tomorrow with regularly scheduled, pumpkinless programming! Now go make yourself some pasta. Enjoy! Recipe sounds wonderful and I like the simplicity of it. But I am not a pumpkin fan, do you think this could work with butternut squash? Hi – I just roasted and pureed a pumpkin the other day. I’m so happy I found all these recipes to try! For the pasta, do you think I could use my food processor to mix it up? I recently found your blog thru Pinterest. I love it! I haven’t done it that way (I love making pasta by hand! ), but I don’t see why it wouldn’t work. Let me know if you try it! I absolutely LOVE this idea! I’m not vegan either but I do like to do without animal products when possible, particularly if the final product turns out to be even better than the original. Will be making this in the very near future! This sounds like SO much fun to make with the kids. When we make pasta they use little cookies cutters and then we have the best time eating noodle soup for dinner. I can’t wait to give these a go! I’m thinking of cooking this for my friends sometime but I don’t cook or know enough about food to match other dishes to this… Could you please help me? What kind of flavor would go along with this pasta? Do you have any recommendations? Maybe something for dessert as well? Hahah, thanks! I linked to a wonderful (and easy) sage butter sauce recipe in the post that would be great with it! Serve it with a Caesar salad, some crusty bread, and some wine, and you’re good! Cheesecake is always a good dessert option. The ones you get in the frozen section of the bakery at the supermarket are actually really delicious! 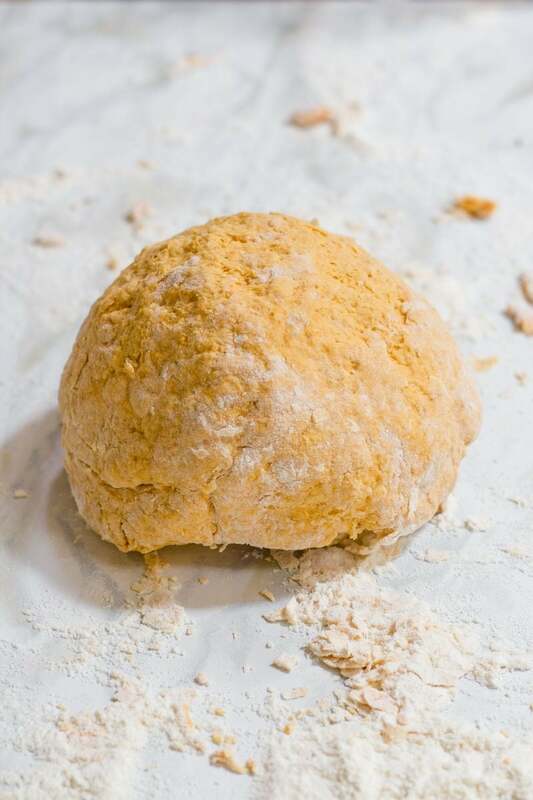 Do you think that this recipe can be done well with a gluten free flour instead? Thanks a lot!! Seems really delicious! I don’t do a lot of work with gluten-free flours, so I honestly don’t know! Let me know if you try it. I’m curious! I’m just wondering how long it can be stored in the fridge uncooked and cooked? After having this pinned for a while I finally made this. I love it so much more than using egg which always goes everywhere!!! It’s beautiful to work with, so silky and malleable. Gorgeous! I was wondering too how long it would last in the fridge or even freezer. One can makes 4 portions but I’m just one person! Also wondering if it might work in lasagne… only one delicious way to find out I suppose! This pasta is absolutely lifechanging. So easy to make and absolutely delicious. I served it with a red sauce and ricotta… The pumpkin taste wasn’t strong. Thanks for posting!! Do you think you could dry the pasta and package as gifts? I realize it could not be too long as there are no preservatives..
Hi! I have tried several of your recipes and came upon this one by accident. Is there a way to store this, do you think? Maybe make the pasta..cook some of it and store the rest? I’m open to suggestions. Do you think you can you still use a pasta maker with this? I’m guessing there’s no reason not too, though I wondered since it doesn’t have egg if maybe the binding wouldn’t hold it as well. I actually like using my pasta maker! I don’t use eggs in my fresh pasta. Only water until now and I have no issues using pasta maker. Oops! Nevermind. I see you addressed that comment above. Thanks! You make it sound easy, pumpkin pasta, i’ll try it, Thank you!!!! Would this work with a whole grain flour such as whole wheat? I make it with white whole wheat all the time! Just cut back a touch on the amount of flour (maybe a tablespoon or two), because whole grain flour is a bit denser. Thank you for the wonderful recipe! We made it with sweet potato puree instead of pumpkin and it will definitely be in our regular meal rotation. I LOVE this recipe! In comparison to egg noodles, this pasta is more delicate and less tough. The color is wonderful as well. NExt time, I am going to try it with 100% whole-wheat flour or maybe brown rice flour for my gluten-free followers. Definitely will make again. I’m linking my post back here. Delicious! Ooh, let us know how making it GF goes! We’d love to hear! My noodles turned to mush in the water. What did I do wrong? Oh no! It is very easy to accidentally overcook these – they should only be cooked for about 2 minutes. Is it possible that that’s the problem? Does this pasta need to dry before cooking? Nope, you can use it fresh! Delicious!!! My husband loves fresh pasta but I hate the flavor of eggs and I can always taste them in fresh pasta. We made this tonight with leftover roasted butternut squash and it was soooooo good! We had it simple with just butter and a little parmesan. Will definitely be making this again and again! We did roll it using a pasta machine and it worked great.